Hire your own Hens day private boat for 4 hours or so and take Perth River cruise around the Swan river. 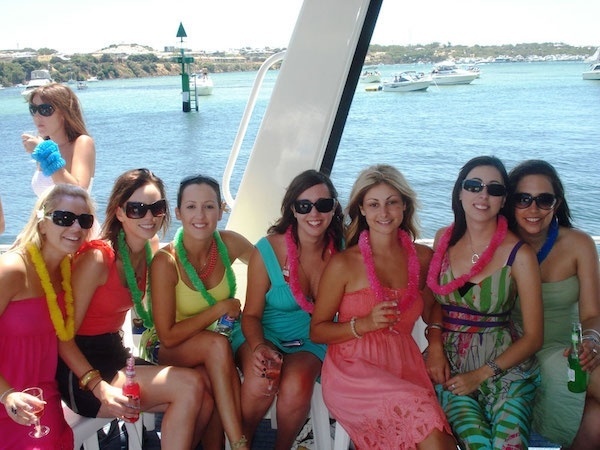 Make sure your hens party in Perth is one to remember by having the best hens night possible! Amazing experience and so much fun for everyone. You have the choice of two locations to set sail from, Barrack Street or Fremantle. So you can spend the day being all classy at first, then you can unleash your party side, kick off your heels once you get on board! A few drinks on a boat with you personal waiter or even Hens Entertainment. Perth is a great place if you want to do some good old fashion sightseeing during your hen weekend. When it comes to tourism Pelican charters hens parties at Rottnest Island or to Carnac island for the Day on your very own private charter boat party.